So guys, I touched up on ‘nautical styling’ in and around the home and yesterday – whilst looking through Jack Wills clothing, I thought I’d browse their homeware section. 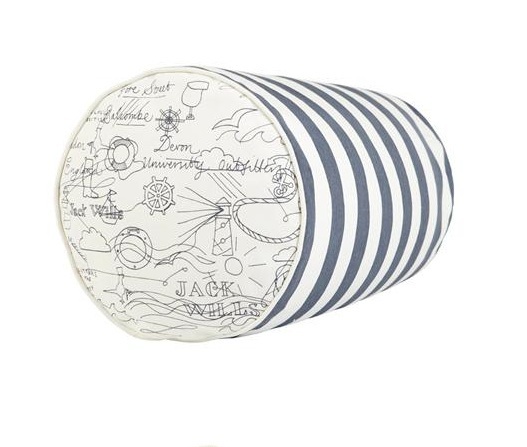 Whilst browsing I immediately noticed that some of the Jack Wills cushions and throws fit in extremely well with nautical decor! Not only are their cushions nautical, but some of their blankets are too. I especially love the white, red and blue colours used across the Jack Wills range – very British and very nautical! Decisions decisions: Nautical or teal stripes? For our spare bedroom, Kelly has decided on white wooden furniture. I love white bedroom furniture as it tends to make a bedroom look clean and fresh, and it’s bound to look amazing against the striped teal wallpaper we’ve seen for our statement wall. The initial thought I get when I think of white wooden furniture is ‘nautical’. Nautical is proving to be highly popular within home interiors, and there’s always lots of nautical design ornaments available in home interior shops. In our spare room, we will be steering away from the nautical designs and inviting splashes of teal in to the bedroom decor. I can’t wait to crack our paint open and get started with this one. Often, people take the mickey out of me for being so particular when it comes down to ‘arranging’ things. I mean, I may have OCD but does this really contribute to the way I arrange our bedroom cushions – I think it does! Usually I arrange things in fours, but with these six square cushions (and the round Dorma cushion which Kelly insisted we buy – I must admit mind, Diesel our black cat appreciates it the most!) I find it hard to leave the room without ‘faffing on’ trying to make them look show home standard. 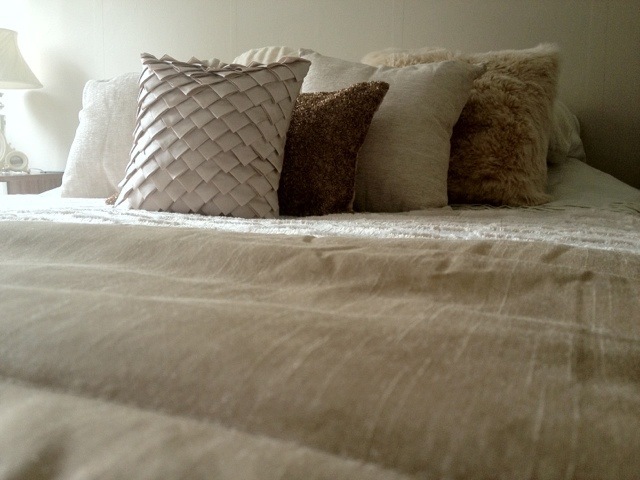 I love the way the cushions incorporate different shades and textures! Does my bum look thin in this!? What is it about mirrors that gets me soooo excited! I absolutely love our brand new silver wall mirror, which was supposed to be a freestanding mirror – until Kelly took her screwdriver to it! I love the way it fills that empty space between the wall and that horrid storage heater, which actually looks better since I decided to place our ‘Love’ wooden ornament on top of it. All that’s left in this room is to source a cream headboard and wallpaper the wall – one step at a time. So it’s been long enough for me to give an honest opinion of our two Birlea Lynx two door wardrobe, which we purchased in walnut/cream finish. The wardrobe itself looks appealing with its two cream gloss doors, and for its size it sure can store a lot of clothing! Kelly and I opted for the ‘no drawer option’ as we did not want to lose out on the storage shelf inside. 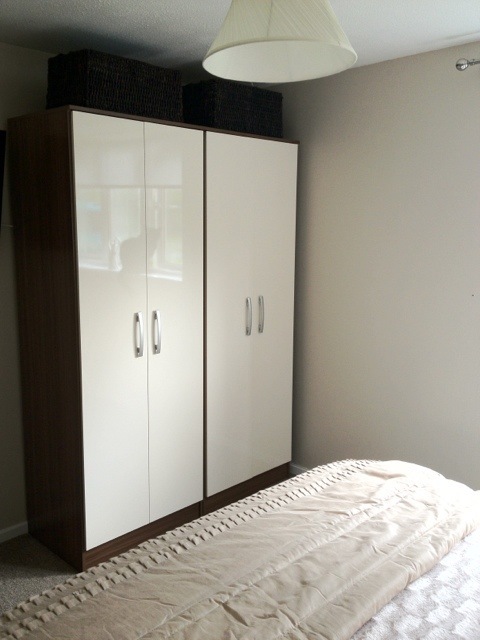 The wardrobes are very compact and, unlike some wardrobes available in the bedroom furniture industry, the doors are not overly heavy for the frame. The frame is sturdy and the inside shelf is fitted to the side panels via dowels and screws – unlike some wardrobes which have pins for the shelf to rest on. The wardrobes have a wooden pole which is covered in silver, giving it a metal look finish. 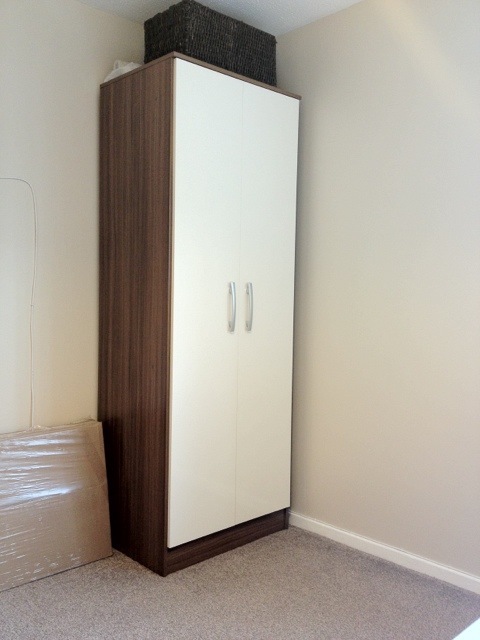 These wardrobes were easy to assemble and came with easy to follow instructions. Over all I am impressed with the Birlea Lynx range, and I would highly recommend this furniture for any contemporary bedroom space. Mirror mirror on the wall, who’s the bestest of them all? Over the weekend I was determined to sort out all the odd jobs which we had been putting off for weeks. With Trev at hand with his trusty tools, it seemed a perfect opportunity to have these jobs sorted once and for all. I had already purchased picture wire for us to hang our two ornate mirrors. 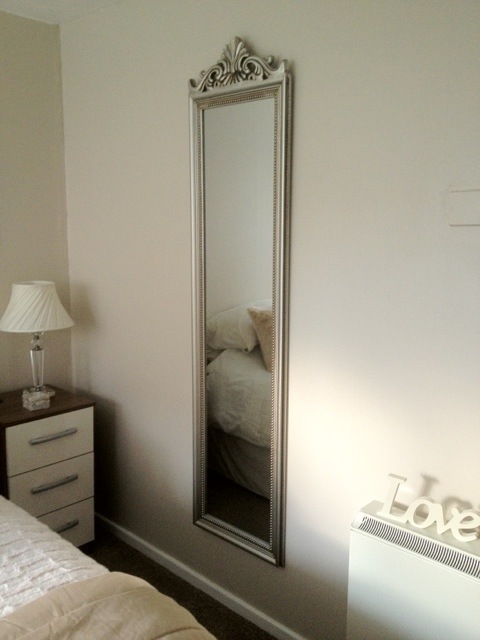 The bedroom mirror was a doddle – and I must say that it looks fabulous! 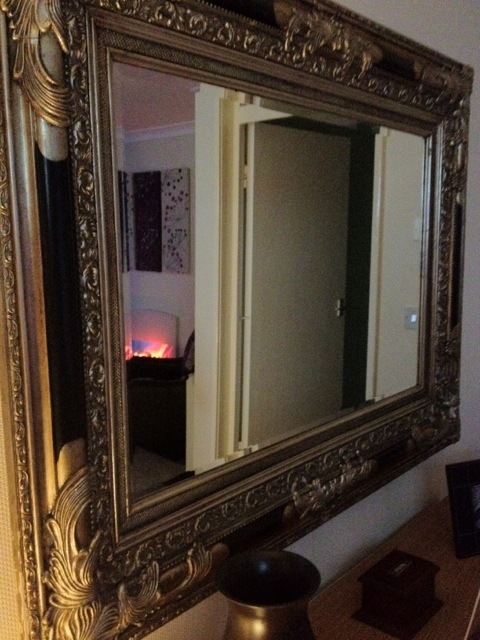 The living room wall mirror was slightly more challenging, due to the sheer weight of the mirror. Luckily Trev was at hand to assist. Both wall mirrors look stunning in their place, and Trev and I could not resist stepping back and admiring the work we had done! Well, I’m sat in my bedroom watching Trev assemble the second of our brand new Birlea Lynx cream two door wardrobe. Apparently his brand new Snap-On screwdriver at £42 is ‘beautiful’. Trev, such a lovely man, is quite the perfectionist when it comes to DIY. Before he makes a start he ensures that the correct number of screws are present, and that everything is in perfect condition! If its good enough for trev, then it’s good enough for our luxurious bedroom! The ‘aran jumper’ is back! I absolutely heart Laura Ashley, they’re furnishings are simply LUXURIOUS! My previous post got me thinking about Laura Ashley, and I just couldn’t resist browsing their sale page. Currently in the living room, not only do we desperately need the ornate mirror hanging – we also need a variety of cushions and throws for our black corner couch. 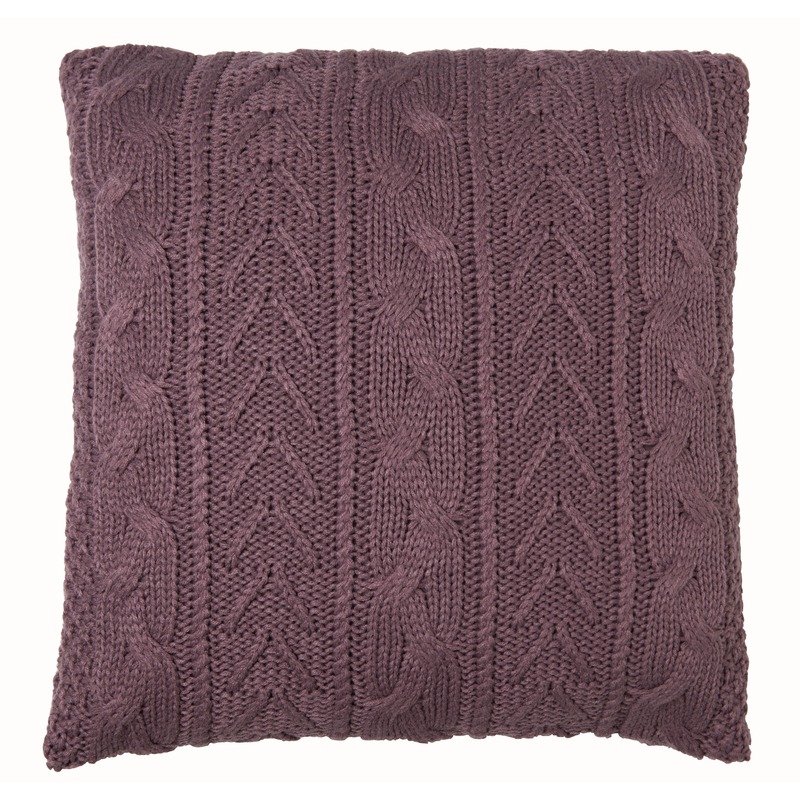 After browsing the Laura Ashley sale page I have some great ideas for the types of cushions to purchase. With money quite tight recently, due to the recession and decorating, I will either be browsing the aisle of Wilkinson’s, Matalan and TK Maxx – or simply digging out that aran jumper my granny so kindly knitted me last year, along with the Singer sewing machine, and making my very own knitted cushions. What is Country Bumpkin Appeal? Country bumpkin appeal, to me, is your average old fashioned décor. 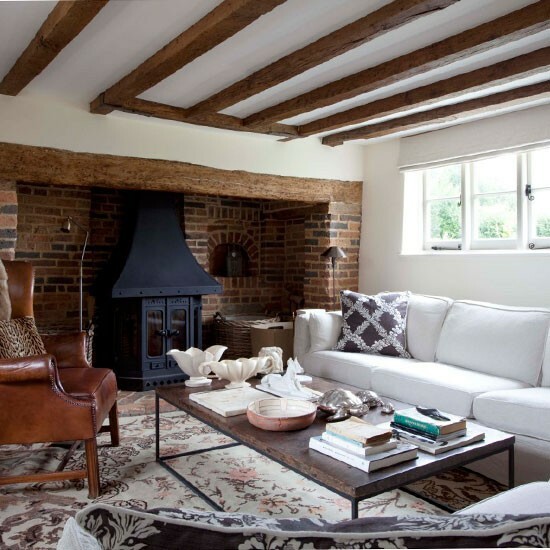 For instance, if you think of an example of a typical country farmhouse kitchen or a small cottage living room with a log fire and wooden beamed ceiling – that falls in to ‘country bumpkin styling’. I quite like country bumpkin appeal I think it’s great in the correct home – I mean you wouldn’t exactly go and put a pine farmhouse table in to a modern kitchen! That would be ludicrous. Speaking of Come Dine with Me, I was amazed to see Darlington on there recently. What a fantastic show, the hosts really did bring a performance to our screens – especially Eseyoma (Queen Sheeba). I love these shows, as I can’t resist checking out what decor the individuals have in their homes! If I recall correctly, Eseyoma had an extremely modern home with lots of splashes of colour. I loved her kitchen ornaments on the window ledge, they were huge – what were they? James, our Darlington area Boris Johnson look-a-like, he was just fantastic. His home had that sort of, what I like to call, country bumpkin appeal – such a lovely man. I guess I’d need a bigger dining table if I was having him over to dine, especially if he brought his tray of ghoulish ‘offal’.